Nestled in the uber trendy Brisbane suburb of New Farm, just opposite Cru Bar (what used to be my fave haunt for lychee martinis), sits Gerard’s Bistro, dark, cosy and fabulous. I was keen to chat with the chef here, Ben Williamson, who I had heard a lot about. But this particular night was filled with bizarre Brisbane weather—rain and chilly—and the thought of plonking myself in a restaurant filled with crisp linens and sharp lines was utterly unappealing. And then we walked into Gerard’s Bistro. Shown to a fab corner table in the back, complete with cushions that you could melt into, I immediately perked up at the eclectic design and off-centre angle framework that could easily be featured in Architectural Digest. As it turns out, Elie Moubarak, co-owner of Gerard’s Bistro, is also an avid designer and lover of angles and based the restaurant’s design around the concept of geometry. We indulged in dishes like coal-grilled octopus with green strawberries, butter, almond, chilli and smoke, and fried cauliflower with tahini, ras el hanout, pomegranate and almond…you wouldn’t think that cauliflower and pomegranate could create such an explosion of flavours in your mouth but believe you me, this is a dish that you shouldn’t miss out on! With two chef hats, Chef Ben Williamson’s Citi Chef of the Year award, and being named Restaurant of the Year in the Brisbane Times 2014 Good Food Guide awards, this place keeps raking in the accolades and for good reason! 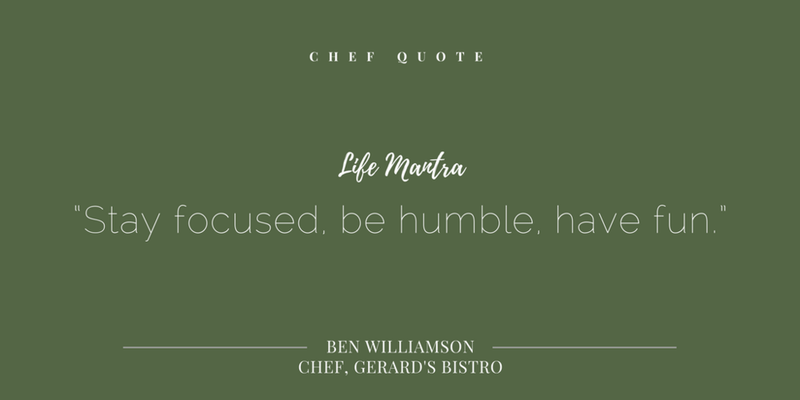 Chef Ben Williamson grew up in Western Australia and started cooking when he was 15 years old. Both his mother and late grandmother were great home cooks, especially his grandmother, he recalls. After about five years, he moved to Sydney to work, then went on to Bahrain to work as an in-flight chef for Gulf Air. He did this for around five years and really made the most of the benefits and travelled as much as he could. After a while, he craved the pace and adrenaline of restaurant service and moved back to Perth. His wife is a Brisbane girl and after their son was born, she wanted to be closer to her family so they moved here after around a year. Chef Ben worked in a few great restaurants with various styles but hadn’t found my niche. But there was a spark when he was introduced to his current business partners, who are of Lebanese decent, through a mutual friend. They hit it off straight away and decided to move forward. All I can say is, all of those flavours come together perfectly! Before I went to Bahrain, I had lost my passion to a degree. However, towards the end of my five years travelling and eating around the world, I began to crave the high pace and aggression of the restaurant kitchen. I really just wanted to work in the toughest, hardest places that I could. I was in my late twenties at that stage so I knew deep down that this was who I was and that I wanted to excel. After meeting the Moubarak brothers and discussing the concept that now defines my style, the business side just followed organically. Learning from every experience no matter how small and adapting to change readily and willingly when necessary. Also staying humble no matter how well we are commended! How would you describe Gerard’s Bistro and the audience? We provide thought provoking textural food with interesting combinations of flavour that reflect the design of the space with relaxed informative service. We’re positioned in the heart of Brisbane’s boutique fashion district but I would say our audience is broad and varied. People come to us because you can’t find anything like us anywhere else! Consistency in our signatures for sure but I’d also say that there is always something exciting and new to try. Could you name one Middle Eastern culinary legend who has inspired you throughout your career? Greg Malouf for sure. His cookbooks have always been on my shelf for reference, especially in the early days of the bistro. What’s your secret behind creating your menu? Most dishes almost always begin with either a main ingredient that I want to elevate and complement or a traditional dish that I want to dissect and reimagine. The most important thing in a menu is diversity of dishes while maintaining a progression of flavours that makes sense to the diner. Poor, uninformed versions of great cuisines. I honestly couldn’t say. I think all ingredients give me infinite diversity. The rules are constantly blurred with food these days especially with subtle saltiness and vegetables as desserts. There are so many great chefs leading the way with this. Reducing food waste is also a major factor in the modern kitchen. It’s something that we embrace so even vegetable trim gets dehydrated to make dusts and ashes to enhance dishes. There are so many great restaurants that it is almost an injustice to name only one. However, I am a massive fan of Nick Holloway’s Nu Nu in Palm Cove. It’s a great representation of his region in the tropical north and he’s a champion of the local producers. He is also one of the biggest legends you’ll ever meet. Josh Lewis of Fleet in Brunswick Heads NSW. He and partner Astrid run a twenty seat restaurant almost by themselves doing super interesting food and great boutique wine. It’s the hottest ticket around and really hard to secure a booking now. Where is Ben Williamson in 10 years’ time? Hopefully still relevant and happily married. Trust, Ben. Keep doing what you’re doing and you will most definitely still be relevant in 10 year’s time! I’m so glad I didn’t let the rain and cold deter me from spending an evening at Gerard’s Bistro because oh, how I would have missed out! Until next time.